The attenuation of an optical fiber measures the amount of light lost between input and output. Total attenuation is the sum of all losses. where P(z) is the optical power at a position z from the origin, P(0) is the power at the origin. 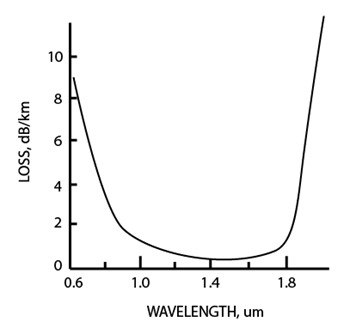 For a given fiber, these losses are wavelength-dependent which is shown in the figure below. 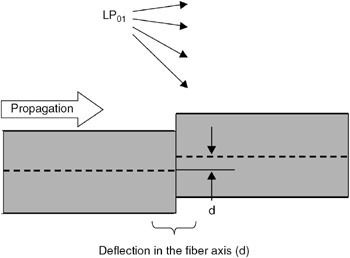 The value of the attenuation factor depends greatly on the fiber material and the manufacturing tolerances, but the figure below shows a typical optical fiber’s attenuation spectral distribution. The typical fused silica glass fibers we use today has a minimum loss at 1550nm. Absorption is uniform. The same amount of the same material always absorbs the same fraction of light at the same wavelength. If you have three blocks of the same type of glass, each 1-centimeter thick, all three will absorb the same fraction of the light passing through them. Absorption also is cumulative, so it depends on the total amount of material the light passes through. If the absorption is 1% per centimeter, it absorbs 1% of the light in the first centimeter, and 1% of the remaining light the next centimeter, and so on. Intrinsic absorption is caused by interaction of the propagating lightwave with one more more major components of glass that constitute the fiber’s material composition. These looses represent a fundamental minimum to the attainable loss and can be overcome only by changing the fiber material. An example of such an interaction is the infrared absorption band of SiO2 shown in the above figure. However, in the wavelength regions of interest to optical communication (0.8-0.9um and 1.2-1.5um), infrared absorption tails make negligible contributions. Extrinsic impurity ions absorption is caused by the presence of minute quantity of metallic ions (such as Fe2+, Cu2+, Cr3+) and the OH– ion from water dissolved in glass. The attenuation from these impurity ions is shown in the following table. From the table above, we can see that 1 part per million (ppm) of Fe2+ would lead to a loss of 0.68 dB/km at 1.1um. This shows the necessity of ultrapure fibers. Luckily, losses due to the metallic ions can be reduced to very low by refining the glass mixture to an impurity level below 1 par per billion (ppb). The OH– ion from water vapor in the glass leads to absorption peaks at 0.72um, 0.88um, 0.95um, 1.13um, 1.24um and 1.38um. 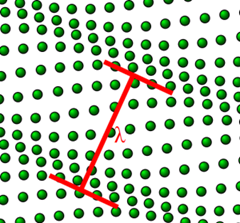 The broad peaks at 1.24um and 1.38um in the first figure cure are due to OH– ion. The good news is OH– ion absorption band is narrow enough that ultrapure fibers can achieve losses less than 0.2 dB/km at 1.55um. With new manufacturing techniques, we can reduce the OH– ion content to below 1 part per billion (ppb). The results are ultra-low-loss fibers which have a wider low-loss window in silica glass fibers shown in the following figure. This improvement enables the use of WDM technology in fiber optic networks, which dramatically increased the capacity of fiber optic systems. When fused silica glass fiber is exposed to hydrogen gas, attenuation of the fiber also increases. The hydrogen can interact with the glass to produce hydroxyl ions and their losses. Hydrogen can also infiltrate the fiber and produce its own losses near 1.2um and 1.6um. The fibers can come into contact with hydrogen which is produced by corrosion of steel-cable strength members or by certain bacteria. The way to solve this problem is to add a coating to the fiber that is impermeable to hydrogen. Scattering losses occur when a wave interacts with a particle in a way that removes energy in the directional propagating wave and transfers it to other directions. The light isn’t absorbed, just sent in another direction. However, the distinction between scattering and absorption doesn’t matter much because the light is lost from the fiber in either case. 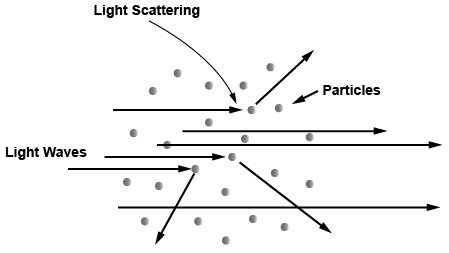 There are two main types of scattering: linear scattering and nonlinear scattering. For linear scattering, the amount of light power that is transferred from a wave is proportional to the power in the wave. It is characterized by having no change in frequency in the scattered wave. On the other hand, nonlinear scattering is accompanied by a frequency shift of the scattered light. Nonlinear scattering is caused by high values of electric field within the fiber (modest to high amount of optical power). Nonlinear scattering causes significant power to be scattered in the forward, backward, or sideways directions. Rayleigh scattering (named after the British physicist Lord Rayleigh) is the main type of linear scattering. It is caused by small-scale (small compared with the wavelength of the lightwave) inhomogeneities that are produced in the fiber fabrication process. Examples of inhomogeneities are glass composition fluctuations (which results in minute refractive index change) and density fluctuations (fundamental and not improvable). Rayleigh scattering accounts for about 96% of attenuation in optical fiber. As light travels in the core, it interacts with the silica molecules in the core. These elastic collisions between the light wave and the silica molecules result in Rayleigh scattering. If the scattered light maintains an angle that supports forward travel within the core, no attenuation occurs. If the light is scattered at an angle that does not support continued forward travel, the light is diverted out of the core and attenuation occurs. Depending on the incident angle, some portion of the light propagates forward and the other part deviates out of the propagation path and escapes from the fiber core. Some scattered light is reflected back toward the light source. This is a property that is used in an OTDR (Optical Time Domain Reflectometer) to test fibers. where R is the distance between the particle and the observer, θ is the scattering angle, n is the refractive index of the particle, and d is the diameter of the particle. Rayleigh scattering can be defined as scattering in the small size parameter regime x ≪ 1. Scattering from larger particles is explained by the Mie scattering for an arbitrary size parameter x. For small x the Mie theory reduces to the Rayleigh approximation. It can be seen from the above equation that Rayleigh scattering is strongly dependent upon the size of the particle and the wavelengths. The intensity of the Rayleigh scattered radiation increases rapidly as the ratio of particle size to wavelength increases. Furthermore, the intensity of Rayleigh scattered radiation is identical in the forward and reverse directions. 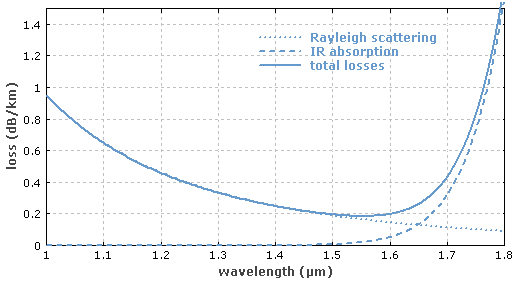 The Rayleigh scattering model breaks down when the particle size becomes larger than around 10% of the wavelength of the incident radiation. 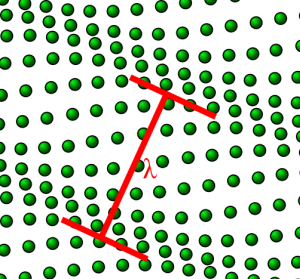 In the case of particles with dimensions greater than this, Mie’s scattering model can be used to find the intensity of the scattered radiation. Rayleigh scattering depends not on the specific type of material but on the size of the particles relative to the wavelength of light. 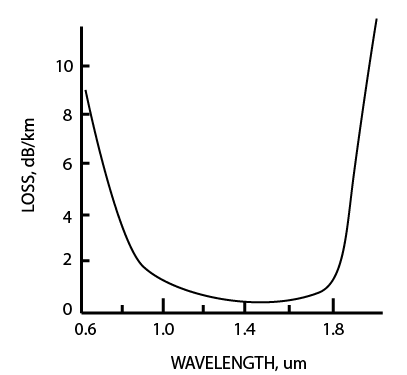 The loss due to Rayleigh scattering is proportional to λ-4 and obviously decreases rapidly with increase in wavelength (see the first figure above – Loss vs.. Wavelength). Short wavelengths are scattered more than longer wavelengths. Any wavelength that is below 800nm is unusable for optical communication because attenuation due to Rayleigh scattering is too high. The above formula predicts the Rayleigh scattering loss to be 0.31 dB/km at 1.3um and 0.15 dB/km at 1.55um wavelengths. From the figure above (you can also refer to the first figure in this tutorial), we can see that the fundamental loss limits for a silica-based glass fibers are the Rayleigh scattering at short wavelengths and the material absorption (the infrared absorption) properties of silica (SiO2) at long wavelengths. A theoretical attenuation minimum for silica fibers can be predicted at a wavelength of 1550nm where the two curves cross. This has been one reason for laser sources and receivers that work in this portion of the spectrum. Mie scattering is named after German physicist Gustav Mie. This theory describes scattering of electromagnetic radiation by particles that are comparable in size to a wavelength (larger than 10% of wavelength). For particles much larger, and much smaller than the wavelength of scattered light there are simple and excellent approximations that suffice. For glass fibers, Mie scattering occurs in inhomogeneities such as core-cladding refractive index variations over the length of the fiber, impurities at the core-cladding interface, strains or bubbles in the fiber, or diameter fluctuations. Mie scattering can be reduced by carefully removing imperfections from the glass material, carefully controlling the quality and cleanliness of the manufacturing process. Here is an interactive Mie Scattering calculator on the web developed by Scott Prahl. Brillouin scattering is caused by the nonlinearity of a medium. In glass fibers, Brillouin scattering shows as a modulation of the light by the thermal energy in the material. An incident photon can be converted into a scattered photon of slightly lower energy, usually propagating in the backward direction, and a phonon (vibrational energy). This coupling of optical fields and acoustic waves occurs via electrostriction. The frequency of the reflected beam is slightly lower than that of the incident beam; the frequency difference vB corresponds to the frequency of emitted phonons. This is called Brillouin Frequency Shift. This phenomenon has been used for fiber optic sensor applications. Brillouin scattering can occur spontaneously even at low optical powers. This is different than Stimulated Brillouin Scattering which requires optical power to meet a threshold high enough to happen. Above a certain threshold power, stimulated Brillouin scattering can reflect most of the power of an incident beam. The optical power level at which stimulated Brillouin scattering becomes significant in a single mode fiber is given by the empirical formula below. Stimulated Raman scattering is a nonlinear response of glass fibers to the optical intensity of light. This is caused by vibrations of the crystal (or glass) lattice. Stimulated Raman scattering produces a high-frequency optical phonon, as compared to Brillouin scattering, which produces a low-frequency acoustical phonon, and a scattered photon. 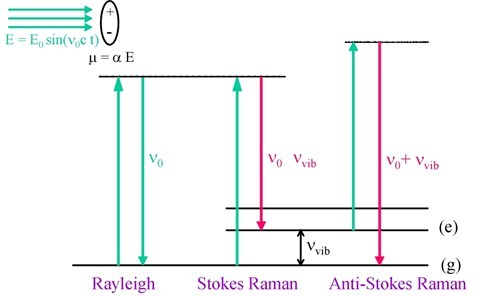 When two laser beams with different wavelengths (and normally with the same polarization direction) propagate together through a Raman-active medium, the longer wavelength beam can experience optical amplification at the expense of the shorter wavelength beam. This phenomenon has been used for Raman amplifiers and Raman lasers. In Stimulated Raman scattering, the scattering is predominately in the forward direction, hence the power is not lost to the receiver. Macrobending happens when the fiber is bent into a large radius of curvature relative to the fiber diameter (large bends). These bends become a great source of power loss when the radius of curvature is less than several centimeters. Macrobend may be found in a splice tray or a fiber cable that has been bent. Macrobend won’t cause significant radiation loss if it has large enough radius. However, when fibers are bent below a certain radius, radiation causes big light power loss as shown in the figure below. Corning SMF-28e single mode fibers should not be bent below a radius of 3 inches. 50um graded-index multimode fibers, such as Corning Infinicor 600, should not be bent below a radius of 1.5 inches. 62.5um graded-index multimode fibers, such as Corning Infinicor 300, should be be bend below a radius of 1 inch. 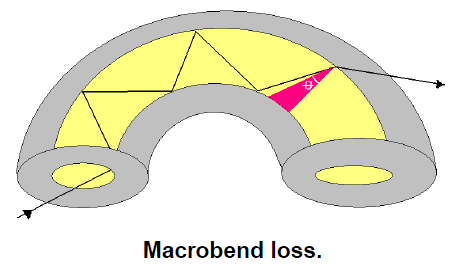 Microbendings are the small-scale bends in the core-cladding interface. These are localized bends can develop during deployment of the fiber, or can be due to local mechanical stresses placed on the fiber, such as stresses induced by cabling the fiber or wrapping the fiber on a spool or bobbin. Microbending can also happen in the fiber manufacturing process. It is sharp but microscopic curvatures that create local axial displacement of a few microns (um) and spatial wavelength displacement of a few millimeters. Microbends can cause 1 to 2 dB/km losses in fiber cabling process. The following figure shows the the impact of a single microbend, at which, analogous to a splice, power can be coupled from the fundamental mode into higher order leaky modes. Because external forces are transmitted to the glass fiber through the polymer coating material, the coating material properties and dimensions, as well as external factors, such as temperature and humidity, affect the microbending sensitivity of a fiber. Microbending sensitivity is also affected by coating irregularities such as variations in coating dimensions, the presence of particles such as those in the pigments of color coatings, and inhomogeneities in the properties of the coating materials that vary along the fiber axis. Interface inhomogeneities can convert high-order modes into lossy modes extending into the cladding where they are removed by the jacket losses. Impurities trapped at the core-cladding interface or impurities in the fiber buffering can cause these inhomogeneities. Single mode fibers are more susceptible to losses from geometric irregularities or defects in the jacket material. However, optical fiber manufacturing technology have improved so much that these interface inhomogeneities now play a insignificant role in fiber losses.